E-commerce is rapidly becoming the preferred choice of many consumers when it comes to shopping, which is beginning to threaten the very existence of traditional brick-and-mortar retail stores. 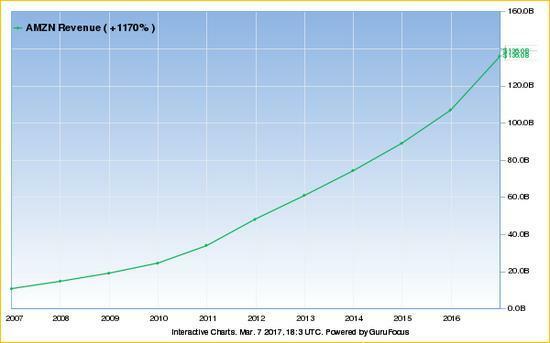 Since its emergence in the late 1990s, Amazon (AMZN) has grown to become one of the largest retailers in the world, online or otherwise. Warning! GuruFocus has detected 3 Warning Sign with AMZN. Click here to check it out. With a market capitalization of more than $400 billion, Amazon is almost twice the size of traditional retail store giant Wal-Mart (WMT), which is currently valued at around $214 billion. Amazon's growth has caught the eye of several traditional retailers and a host of online entrepreneurs who seek to capitalize on the growing popularity of online shopping. From giant retailers like Macy's (NYSE:M), Target (TGT), Kohl's (KSS) and J.C. Penney (JCP) to specialized brands such as Truck Dealers Australia, a platform that deals in new and used trucks, as well as Boohoo and Koovs (both specializing in men's and women's attire), everyone believes they can get a piece of the e-commerce cake. In return, many traditional retail chains have been forced to close several of their branches in an attempt to cut costs. Macy's, Kohl's and J.C. Penney have been among those that have closed several outlets over the last few years, which has negatively impacted their capacity to grow revenues. 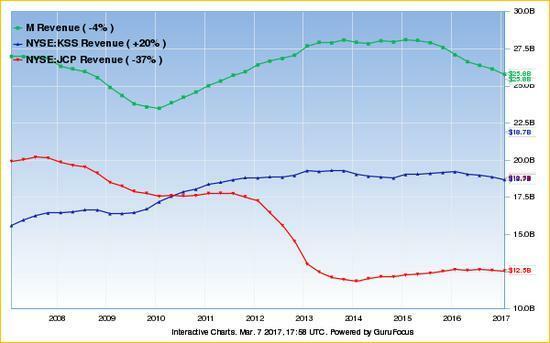 As per the chart below, it is pretty clear the revenues of traditional department stores like Macy's, Kohl's and J.C. Penney have stalled over the last decade, while their online counterparts have continued to gain customers. For instance, Amazon's top line has continued to soar, climbing past the $135 billion mark in the most recent financial year. The company crossed the $100 billion revenue threshold in 2015 and already looks set to breach the $160 billion to $170 billion range in 2017, according to analyst estimates. The number of customers buying products in traditional retail stores continues to decline as a large majority of consumers shift their shopping activities to various online platforms. Amazon and eBay (EBAY) have been some of the biggest beneficiaries of this shift. According to research done last year by analytics firm comScore (SCOR) and UPS (UPS), shoppers now make 51% of their purchases online, compared to 48% in 2015 and 47% in 2014. The survey will be conducted for the sixth time this year and those numbers are expected to be higher based on the current trend. Last year, 5,000 shoppers were polled. Of those, 44% of smartphone users claimed to have bought items via their devices, compared to 41% in the previous year. Again, this trend indicates that with the increasing adoption of mobile shopping across the globe, traditional retail could soon be a thing of the past. Even more interesting is the fact online retail is no longer restricted to small items. Like in the case of Truck Dealers Australia, there are several online platforms shoppers can access when looking to buy new and used vehicles. Right now, buying a vehicle from Japan can be done with the click of a button or a simple swipe and tap on a smartphone. In other words, gone are the days of needing to take a test drive before committing to purchasing a vehicle due to advances in online shopping. And the competition gets tougher when we move to smaller items like clothing and kitchen appliances. The culture of online shopping is gaining traction globally, and the U.S. has been leading the adoption race since the late 1990s. According to a research study published by Pew Research in December of last year, about 80% of all Americans made at least one purchase online. This compares to the research firm's first study on the same subject back in 2000, which found only 22% had made an online purchase. Now, with 80% of Americans already having made an online purchase, it is only a matter of time before the rest of the world catches up. As such, it would be correct to say online shopping is rapidly taking over the retail market. In summary, companies like Kohl's and Macy's have tried to embrace the paradigm shift in consumer behavior, but they have yet to achieve the success found by e-commerce stalwarts like Amazon. Even Wal-Mart could barely manage a sixth of Amazon's online sales in the last financial year. Therefore, the online marketplace is becoming the mainstay of retail, and this seems set to render the traditional brick-and-mortar stores as a rare alternative for online shoppers. It will be an interesting space to watch for the next few years.